Rejecting Applicant's claim that the primary meaning of GUANTANAMERA to the relevant public is the well-known Spanish folk song, the Board sustained an opposition to registration of that mark for cigars on the ground that it is primarily geographically deceptively misdescriptive under Section 2(e)(3). Corporacion Habanos, S.A. v. Guantanamera Cigars Co., 86 USPQ2d 1473 (TTAB 2008) [precedential]. The Board first found that Opposer, a Cuban company subject to the U.S. embargo on Cuban goods, has standing to bring the opposition. Opposer submitted a letter from the U.S. Treasury Department "confirming that Cuban entities are permitted under Section 515.527 of the Cuban Assets Control Regulations, 31 C.F.R. Part 515, to 'file an opposition to the registration of a new trademark ... where these actions relate to the protection of a trademark in which Cuba ... has an interest.'" Moreover, Opposer had filed its own application to register the same mark for cigars. Opposer's Section 2(e)(3) claim required proof that (a) the primary significance of GUANTANAMERA is a generally-known geographic location; (b) the consuming public is likely to believe that the place identified by the mark GUANTANAMERA is the origin of the goods bearing the mark (i.e., that a goods-place association exists), when in fact the goods do not come from that place; and (c) the misrepresentation would be a material factor in the consumer's decision to purchase the goods. 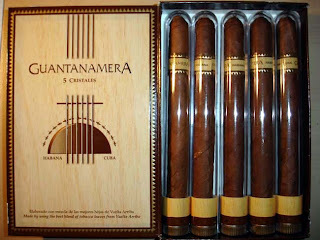 As to the first prong of the test, the Board found that the primary meaning of the term “Guantanamera” is “of or from Guantanamo, Cuba” or “a female from Guantanamo”; that cigar consumers in the United States who speak Spanish would know that Guantanamo is a geographic location and would recognize that meaning; and that this would be especially true in the context of Applicant's goods. As to the second prong, the Board found that consumers are likely to believe that there is a goods-place association between cigars and Guantanamo, Cuba. The evidence indicated that tobacco is grown in the Guantanamo region and that Cuba is renowned for its tobacco and cigars. Applicant itself attempted to "foster an association with Cuba" by falsely stating in its early packaging that its product originated in "Guantanamera, Cuba" and that it contained "Genuine Cuban Tobacco." As to the third and final prong, because Opposer established "Cuba’s renown and reputation for high-quality cigars," the Board found that "the goods-place association created by applicant’s mark with Cuba is material in a consumer’s decision to purchase applicant's cigars." The Board noted that "Applicant evidently believed that the use of Cuban tobacco is a material factor in the decision to purchase a cigar because it included the false claim 'Genuine Cuban Tobacco' on its product packaging." In reaching its conclusion, the Board rejected Applicant's argument that "Guantanamera" has a "wide-spectrum of meanings" and appears in a number of colloquial expressions (e.g., Meter una Guantanamera, meaning "Create a big ruckus"). These Cuban expressions, according to the Board, would not be widely know to Spanish-speaking consumers of Applicant's goods. Applicant also urged that the primary meaning of GUANTANAMERA to the relevant public is the well-known Spanish language folk song of that name. Opposer's own expert stated that "the word 'Guantanamera' is most commonly known to the American public and the Cuban-American community in particular as one of the most famous traditional songs in Cuba, known worldwide, including in the United States." Nonetheless, the Board was not persuaded that, in the context of Applicant's goods, the primary meaning of the mark GUANTANAMERA would be the song. [TTABlog comment: note that the above photograph of Opposer's cigars include a guitar design that presumably is intended to call to mind the folk song]. "[O]ne of the refrains in the song includes the phrase 'guajira guantanamera,' which means 'a country girl from Guantanamo.' *** Thus, even if consumers consider the mark as referring to the song by the same name, such consumers, who know the song and know Spanish, will know the geographical significance of 'Guantanamera" from the song lyrics." Moreover, because Cuban cigars are highly regarded in this country, U.S consumers of cigars will have a "heightened awareness of terms which have a plausible meaning." With regard to cigars, they will "ascribe the geographic meaning to the mark rather than, as applicant suggests, associate the mark with the title of a Spanish language folk song." And so the Board sustained the opposition. The Board dealt with many evidentiary objections in a second and separate ruling (here) issued on the same day as its substantive opinion. TTABlog further comments: Note that the Board distinguishes between three groups of U.S. consumers: those of Cuban extraction (who would recognize the Cuban idioms); Spanish-speaking consumers (who would understand the lyrics of the song as referring to Guantanamo); and others (who, like me, would think only of the song without realizing that it had anything to do with Guantanamo, Cuba). A knowledgeable reader suggests that the splitting of the substantive ruling from the ruling on evidentiary matters may be a first for the Board. Moreover, she asks, why is one ruling precedential and the other not? Did the Board just not want to stick the "precedential" label on its rather mundane evidentiary rulings? Will future readers of the "precedential" decision be able to readily find the "non-precedential" ruling? TTABlog postscript: Applicant has sought review of this decision under Section 1071(b)(1), in a civil action now pending before the U.S. District Court for the District of Columbia. Frank Herrera provides a copy of the complaint at his Cigar Law blog. Cuban cigar especially HDM Churchill are my favourite. Cuban cigars provide such fantastic taste and perfect burn from start to finish. The flavors are simply intense, with earth, spice and licorice building into a dense thick smoke. They have so much character that it is really easy for anyone to illustrate difference between a Cuban and non Cuban cigar.